The Easter holidays have arrived, which means time off with the kids! 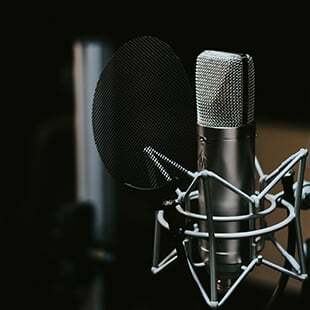 During the school holidays we often feel the pressure to be out and about, DOING stuff. But what about having a laid back day at home of arts & crafts with the kids? Below is a selection of EGGS-tra EASY Easter craft ideas that aren’t too material heavy! In fact, you wouldn’t believe the amount of crafts that rely merely on pen & paper alone! This is possibly one of the simplest crafts to do with the kids these holidays! 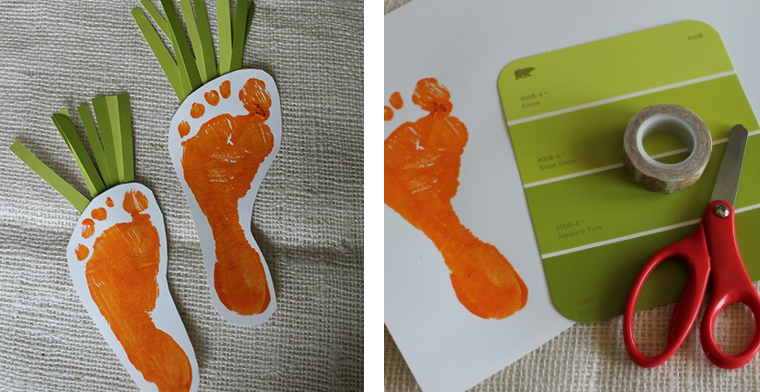 With the use of your own feet, this craft idea really is unique to each kid involved! Paint footprint…then clean feet! Don’t want little orange footprints spread all over the house! Cut footprint out…Of course, some help may be required by an adult with the scissors. Cut strips of green paper. An EXTRA idea – glue the ‘carrots’ to another piece of paper and get the kids to decorate the background with coloured pencils. This craft looks a little tricky from initial glance, but is really quite simple once you get the free stencil in use! Paint the paper plate and a sheet of cardboard grey…If you’re short for time and coloured paints, using coloured card is an easy alternative! The kids can then decorate their Bilby straight away with pens/crayon. Paint a small piece of cardboard pink for the ears, nose and cheeks…AGAIN, coloured card is an easy alternative. Print out the template. Tape the pieces on top of the plate/cardboard and use the template to cut out all the pieces. 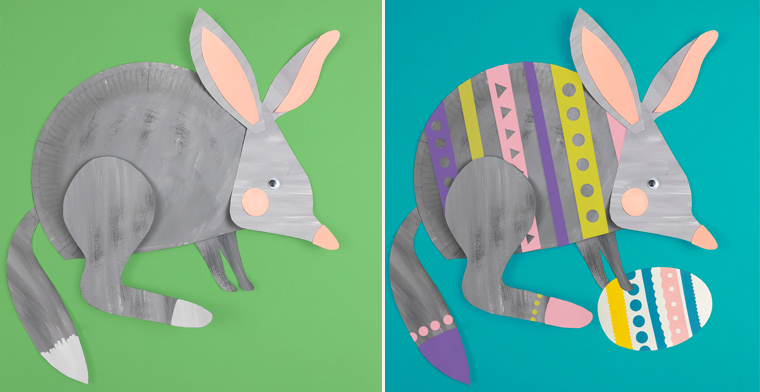 To turn your Bilby into an Easter Bilby, why not use some spare strips of coloured card, get the hole puncher and be creative! FINALLY, assemble all pieces and glue them together! No need to purchase stamps, just make your own! Design your potato stamp patterns…Could be straight/diagonal stripes or even zig-zags! Carefully using a knife (Adults only), cut the design into your potato. 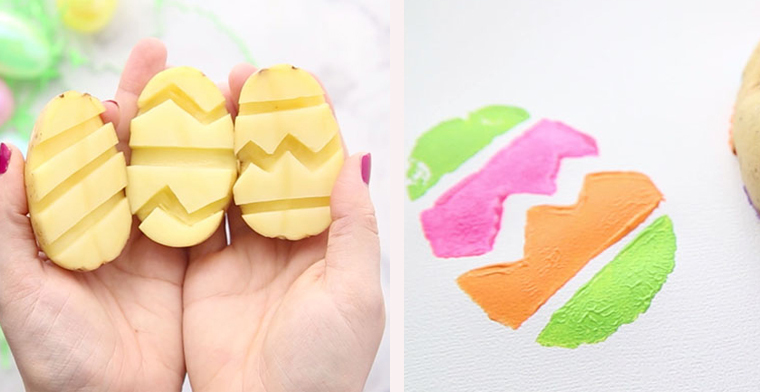 Paint your potatoes different colours and start stamping! Glitter glue the edges of the egg design & add a bit of straw for a finishing touch. 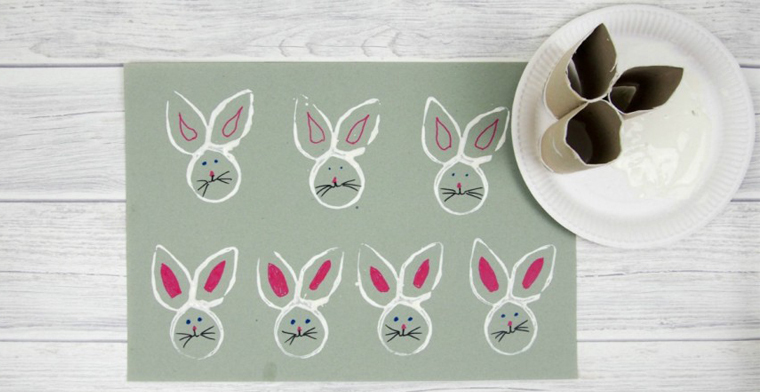 Before throwing out the toilet roll, try recycling it as an Easter Bunny stamp! Fold one side of the toilet roll to a sharp point. Repeat action for other roll – thus creating the bunny ears. Then using the hot-glue gun (adults only), stick them to the circular toilet roll. Allow to dry. Use a paper plate (or paint palate) for your paint/s. Stamp the bunny head design onto paint tray, then paper and allow to dry. FINALLY Use felt tips or paint to design your bunny face. 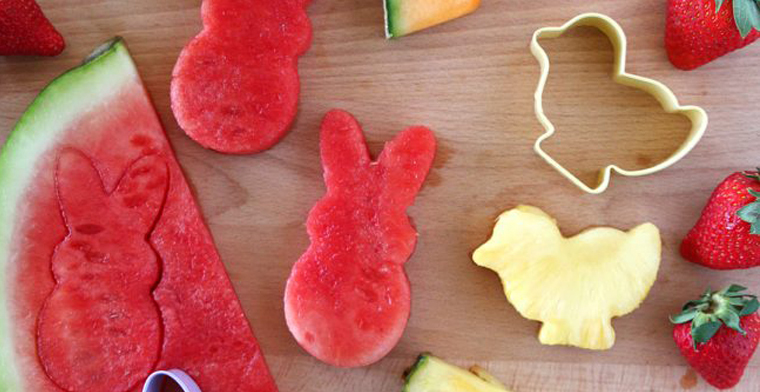 We all know kids love to snack…so why not make it fun and healthy! Where to find Easter-themed cookie cutters?